Following we publish the reflections by Nadia Neri, psychologist and analyst, building on Gabriele Nissim’s editorial “Let’s look at the earth from a drone to counter the culture of the enemy". The discussion paves the way to the second edition of GariwoNetwork, which will analyze the role of the Righteous and the Gardens in the face of the growing culture of hate and enmity. Back in 2007, I devised and edited a book entitled as L’odio. Irreparabile? (Hate. Irreparable?). Taking it up again today, I was really struck by two things: the extreme topicality of the issues it dealt with and, above all, the observation that hatred has nearly become a dominant value. For me, who has worked for over 40 years as a psychoanalyst, it is not hard to identify the profound dynamics at play in our society: resentment, hate and contempt towards the different have emerged from their latent state, and have therefore been justified; and above all we tend to consider as winning a mechanism that allows people never to feel responsible or guilty, because the enemy is always outside ourselves. This mechanism is scientifically put in place on every topic or issue in our society, in a propaganda, which seems as instinctive – but is not at all. History taught us how easy it is to convey hostile feelings toward a people, a religion, a political thought; thus you create a scapegoat on which all hostilities and contempt are projected. Today, these mechanisms are knowing a very dangerous and capillary diffusion through Facebook and Twitter. Each of us is bombed by the news, often false, without any opportunity to challenge them. So, the information is manipulated and selected. For example, if an Italian rapes a woman, this is very little news, but if a foreigner or immigrant commits the same crime, the news is amplified to its maximum extent. And I could list a lot of examples, to such a point we are flooded by this mechanism, now on a daily basis. 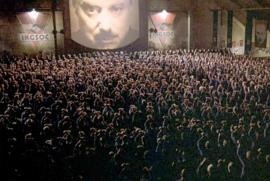 George Orwell, in his famous novel 1984, imagined, in his description of totalitarian life, a telescreen fitted with a power of control and building of consciences, whose function was the establishment of as much as 2 daily minutes of hate. I report some brief descriptions of the two minutes hate because I consider them as very evocative for us today. “As usual, the face of Emmanuel Goldstein, the Enemy of the People, had flashed on to the screen. There were hisses here and there among the audience. The little sandy-haired woman gave a squeak of mingled fear and disgust. Goldstein was the renegade and backslider who once, long ago (how long ago, nobody quite remembered), had been one of the leading figures of the Party, almost on a level with Big Brother himself, and then had engaged in counter-revolutionary activities, had been condemned to death, and had mysteriously escaped and disappeared...”. Today, moreover, we are witnessing kinds of indifference and apathy that are so deeply rooted to leave us upset. Very relevant to this topic are the thoughts by Simona Argentieri: “that kind of narcissistic hate, which seems to me as typical of our era: apathy without passions, not recognizing the existence of the others, or recognizing it, but without attributing to it either value or meaning (nastiness without hate, “innocent” cruelty, narcissistic indifference, “soft” destruction, without violence). This is the dominating atmosphere today. It seems as winning, but we are many, scattered, unconnected to each other, but willing not to let ourselves be crushed by pessimism or despair and to find creative and vital ways to express a strong dissent – along with our values. I cannot help referring to the testimony left to us by Etty Hillesum, as it can show us the way. Hillesum brings back to the foreground and personally lives some fundamental virtues, now relegated to a tiny minority: indignation as an alternative to hate, simplicity as essentiality and compassion. Let us think of the fact that today, performing good deeds is derided as acceptance and political cooperation, with a superficial and shameful propagandistic buzz. Etty Hillesum lived consistently with what she wrote in the notebooks of her Diary, and above all, she managed to bear testimony of revolutionary truths. She was persecuted by the Nazis for being a Jew. I have always been moved by her capability of living and denouncing while she was being persecuted and not afterwards, after the war. Two key points are witnessed by Hillesum: first of all a pressing urge not to hate and not to see the enemy outside us. If we want a better world after the war, says Etty, we must start from an introspective work, discover first in us the existence of all those psychological elements which we criticize in the others, i.e. outside us. “The rot that is in the others is also in ourselves, I kept on preaching; and I see no other solution, really no other one than collecting our thoughts and getting rid of our rot. I don’t believe anymore in the possibility to improve anything in the outer world without prior doing our share inside ourselves. It is the only lesson in this war: we must look inside ourselves, not anywhere else”. From this assertion which went – and still goes – against the stream, Etty drew the second firm point in her way of life: individual responsibility, necessary basis of every authentic democracy. I will only mention – as I can’t really deepen it in this article – Hillesum’s spirituality open to all religious manifestations, beyond any single church, in an uninterrupted and direct dialogue with God. Many people have appreciated and praised Etty Hillesum over the years, but I believe it is important today to pass from a merely intellectual admiration to practising her teachings and testimony in everyone’s life, in the awareness that it will be a difficult, often painful pathway, but also necessary if we really want a better world, certainly very far from the one we are living in.